A day spent on traveling is a lot of time wasted unless you do something productive. Here are some travel tips I picked up on my way to my next destination. The time you spend on travel needn't be idle. Spend your travel time wisely. [Click To Tweet]. Grab every opportunity to be productive. [Click To Tweet]. James Schramko here. I’m just in Miami, I’ve actually flown all the way from Sydney to Los Angeles and then to Miami and I’m heading down to the Dominican Republic. Now today’s video is about utilizing your transport time. It takes about a day to get to somewhere like this, to get to the East Coast of the United States from Sydney. However, it’s truly inspirational what you can do in that time. I have my notes app on the iPhone here, and on the airplane, I watched about four movies, and I read two Kindles from start to finish. The Kindles that I read were about a billionaire talking about all of his life lessons. His name is Boone, and I put a link in the show notes to it. It was an interesting book, I’ll give you my thoughts on it. It was half good and half rubbish, but the half that was good was really good. The other book was a Valerie Khoo book about stories, and your business stories. And that was a really good book, and I think most people in business should read this book to get a feel for what sort of story they’re telling. In terms of the movies, I like watching stuff like documentaries, especially. But I watched one about space jump, the Red Bull space jump, and there was this huge mindset hurdle that Felix had to go through in the four years leading up to jumping from a hundred and twenty-eight thousand feet. And it was a great documentary about the triumph and the struggle. But there was this thing around the space suit. He really hated his space suit, so much that he wanted to quit. But he had a mental change, and he was able to turn that space suit from a terrible experience to a really positive one and overcome it mentally. So I recommend you check out that. It’s a Red Bull documentary, it’s called Space Dive. I also looked at some other ones about Grand Prix, about rally cars, about their safety issues, and I watched a couple of modern movies as well. 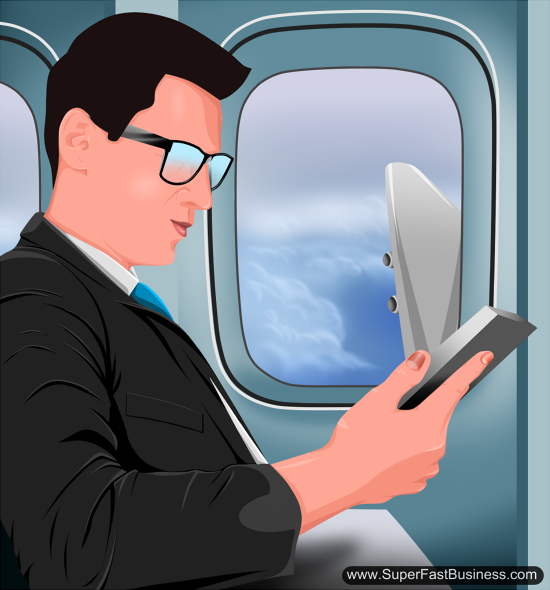 But anyway, my main point is, when you get on a plane or a train or a ferry or a cab or whatever, you can utilize your Kindles, you can make notes. I find that actually heading overseas is my best quiet time. There’s no Internet, I’m thinking, I’m resting. Drink lots of water, set your clock to the destination where you’re heading to, and just sink into their time. They’re my little travel tips at the end there. I’m James Schramko. I’ll be sending you some more videos from the Dominican Republic as I uncover some more lessons while I’m attending a conference down there. Hope you have a great week, speak to you soon. Do you mean you downloaded the movies and documentaries to your Mac prior to boarding? Darren I certainly could however long haul flights generally have them on board. I load kindles to my iPad mini in advance.